Nassau Knolls Cemetery and Memorial Park is a beautiful, peaceful place to visit. A quiet resting place of loved ones, we have been in the business of dignified burials for one hundred fifteen years. As a non-sectarian cemetery we service people of all religions, races and creeds. We have plots available in all sections and a variety of burial options such as, in ground burials, mausoleums, and cremation burials both in ground and niches. We offer holiday promotions for Christmas blankets and wreaths, Palm crosses, and floral bouquets for Mother’s Day, Father’s Day and Memorial Day (with a flag). We also offer power washing for headstone and bronze marker refinishing and resurfacing. Our experienced staff can help you with any questions that you may have, such as how cemetery property is inherited, or how you can sell your unused cemetery plots. Any concerns or requests for tending to your graves can be e-mailed to us at nassauknollscemetery@gmail.com . We will answer and address your concerns quickly and efficiently. We hope you enjoy this web site and find it helpful. 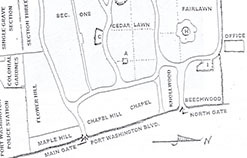 We will update this blog periodically with new and pertinent information as well as cemetery related laws and articles as they come to our attention. Please feel free to drive through our grounds and stop by the office to say hello. 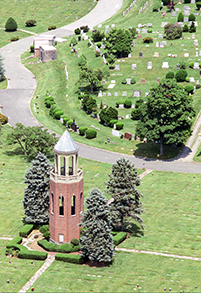 Your choice of burial and memorial will depend on the cemetery location. Please click on the map below to see which areas are still available and which memorials are features in our various sections.